The bright yellow Just-for-the-Fair food truck caught our eye when we came out of the Scott Building and we went over to check it out. We were greeted by two very enthusiastic chef volunteers, Chris and Jeff. They were happy to share the concept of the ACF of NC project. But first they wanted us to meet the other volunteers, Ed, Karl and LJ, working on the truck this night. To our surprise Ed was our friend, Ed Sautro, owner of Amigosan who was donating the use of the Amigosan truck for the fair. While Jeff was taking orders and Karl and LJ were busy cooking them, Chris and Ed gave us the details of the project from the menu selection to the scholarship program. We ended our night at the Fair with a great meal of the BBQ Stuffed Bacon Wrapped Jalapeno Hush Puppies and Cajun Seared Catfish PoBoy with some Sweet Potato fries. 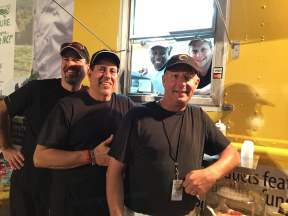 The ACF of NC Just-for-the-Fair Food Truck is located between the Midway and the Scott Building, along the easternmost side of the Fair, near Gate 11. Please stop by and enjoy some locally inspired food. S. Belle.